Proton is expecting to correct the public perception that the local car manufacturer produces sub standard cars with the launch of its latest offering, the Proton Suprima S.
Proton says that this car is RM40,000 cheaper than other makes in the same class. This puts the Suprima S (by Proton's own words) in the same league with Honda Civic, Toyota Altis, Ford Focus and Nissan Sylphy, which are priced around RM115,000 to RM120,000. For comparison, the RM89,000 Kia Forte is known to be in the same segment as Civic, Altis and the peers. Ok, I know the Suprima S is a hatchback, but yes, price-wise - that's what Proton is saying. The Suprima S looks exactly the same as the Preve, except that it is a hatchback. "I hope the perception that Proton produces cheap, low quality cars will be corrected because Proton cars are of the same standard as other famous car manufacturers." - Proton Advisor, Dr Mahathir during the launch of Suprima S.
Suprima S is Proton's first 'hatchback' model fitted with high safety features such as ABS with EBD, brake assist, electronic stability control (ESC), traction control and two rear Isofix mounts. Both Suprima S variants are equipped with six airbags - front, side and curtain. Five colours are available for the Proton Suprima S, these being Atlantic Blue, Fire Red, Genetic Silver, Tranquility Black and Solid White. 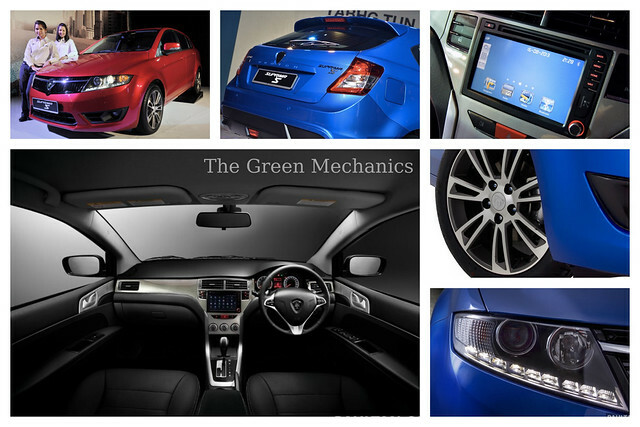 TheGreenMechanics: Go for a test-drive, even if you aren't a fan of proton cars. This one looks nice on paper, we are planning to go to the nearest showroom and touch the metal ourselves. Will it be durable with a turbo on the campro engine,i think fuel consumption will be real bad. Proton = Power-window Rosak, Oh Tidak Oh No!! It is nice that you say this car is rm40k cheaper. But by whose standard? I strongly think rm76k is still expensive. But suckers will still buy it!!! Test drive dulu baru cerita. No obligation, you lose nothing. Anda dialu-alukan berkunjung ke showroom kami.